Reading the Fantastic Four comics from the start. The previous issue gave us a decent-to-good Thing/Hulk fight. Well, Marvel now has a female Thing and a She-Hulk, so ladies get their go at it in issue #321. We begin with Sharon Ventura (a.k.a. Ms. Marvel) breaking down the door of She-Hulk’s apartment, looking for a fight. The Hulk recently defeated Ben (in Incredible Hulk #350). Sharon wants revenge, so Sharon demands She-Hulk tell her where the Hulk is. She-Hulk says she and the Hulk (who is her cousin) have gone their separate ways. Sharon is furious, not listening to reason, and starts a fight. As their slugfest moves from the apartment to the street outside, She-Hulk is unprepared for how strong Sharon has become. After exchanging some punches and throwing some cars at each other, She-Hulk defeats Sharon, as She-Hulk simply has more hand-to-hand combat experience. She-Hulk suggests they talk through their problems rather than keep punching each other. Cut to a mysterious bald man wearing metal armor, watching the heroes from a distance, high up in a skyscraper. He says the fight ended to soon, interrupting his plans. The stranger blows a whistle and summons Dragon Man, who quite epically poses atop the Chrysler Building. Sharon and She-Hulk compare notes. Sharon says Ben is in the hospital suffering from exhaustion, though he’ll be back to his old self within 24 hours. Sharon also says she spotted the bald man while on her way to She-Hulk’s apartment. Sharon and She-Hulk also discuss Sharon’s relationship with Ben, and the fact that Johnny and Alicia are married now. At the hospital, Alicia (who is secretly Lyja the Skrull in disguise) and Ben have a similar talk, with Ben saying her leaving him doesn’t hurt as much. Johnny, meanwhile, flies over NYC, thinking about how he loves Alicia, but part of him still loves Crystal, who recently left him to return to Quicksilver and live with the Inhumans on the moon. She-Hulk and Sharon have another heart-to-heart about how Sharon’s monstrous form has been freeing for her, rather than traumatic. Then, Dragon Man swoops down to attack. Fighting! Dragon Man keeps focusing his attention on Sharon during the battle, despite both heroes landing punches on him. She-Hulk changes tactics, flirting with Dragon Man instead of fighting him. Confused, Dragon Man flies off. She-Hulk explains that when Dragon Man first fought the FF, Dragon Man developed a crush on Sue. Beautiful women, she says, are Dragon Man’s weakness. 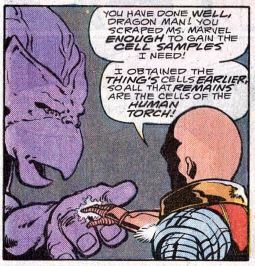 Dragon Man returns to the mysterious stranger, who takes cell samples of Sharon off of Dragon Man’s hand, revealing this was his plan all along. We then learn this mystery man is Aron the Watcher. (Who? He’s a young Watcher who has gone rogue, not bothering with the “watch but don’t interfere” thing.) This would be a “To be continued” except it’s not going to be picked up again for a while. Clobberin’ time: There’s no mention of how Ben got to the hospital, or who this doctor is that knows how to treat him. We’ll have to shrug it off as comic book logic, and an excuse for Sharon to have an adventure without him. Flame on: In his only scene in this issue, Johnny ponders how he’s in love with both Alicia and Crystal equally, and feels huge guilt about it. 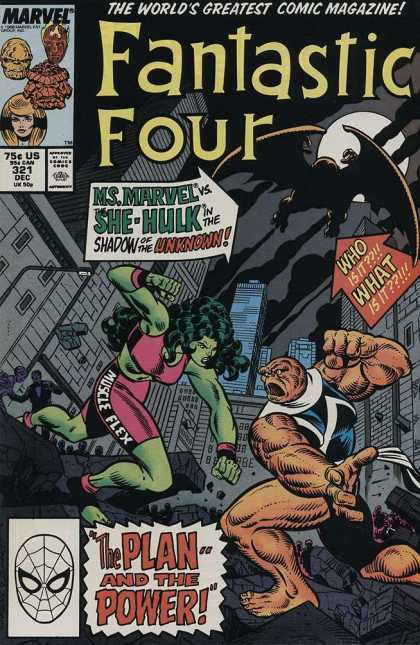 Fantastic Fifth wheel: This isn’t the first time Sharon and She-Hulk have fought. They duked it out when they met for the first time in Thing #36, and She-Hulk won that fight, too. She-Hulk hadn’t been seen much in Marvel since the Avengers disbanded in Avengers #297. In Solo Avengers, she appeared before Congress to argue against the Mutant Registration Act, and in a special Christmas issue of Marvel Comics Presents, she fantasizes about beating up supervillains when spending Christmas alone. Shortly after this, she gets her own solo series from John Byrne, famous for its break-the-fourth-wall comedy. The Alicia problem: Lyja tells Ben that her relationship with Johnny wasn’t planned, but that it just happened. I suppose this is true: She was meant to impersonate Alicia to infiltrate the FF. With Ben gone, she found herself in a relationship with Johnny. Some fans believe Lyja stuck to the mission, and that her love for Johnny was an act, but too much of this wouldn’t make sense if it wasn’t. 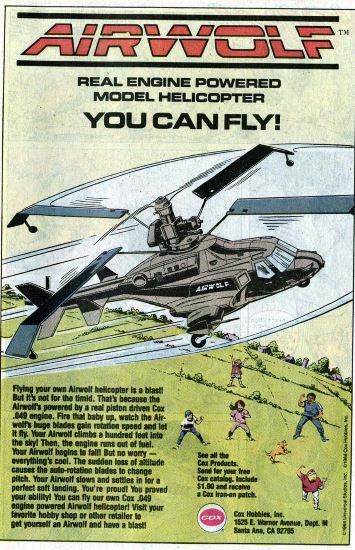 Commercial break: Airwolf! Stringfellow Hawke not included. Trivia time: Aron the Watcher was previously introduced in Captain Marvel, where his presence helped absolve Uatu the Watcher of all the times he had broken his promise never to interfere. The last time we saw Dragon Man was in Fantastic Four #300, where he was being mind-controlled by the Puppet Master. To my knowledge, it’s never been revealed how Dragon Man got away from Puppet Master and ended up under Aron’s control. Fantastic or Frightful? On the plus side, I really like Ron Lim’s artwork. He draws great facial expressions on Sharon, making her feel like a real person under her rocky exterior. That said, this issue is frustrating because the whole Johnny/Crystal/Alicia/Ben/Sharon romantic quintangle should be over by this point, but they just keep rehashing without saying anything new, beating the same dead horse over and over. My memory of this era of FF is that it’s when things got quirky and different, but re-reading it now shows how directionless it all was. Next week: It’s getting hot in here.